In an old production house for fish, out on the fishing pier, you will find our summer restaurant called Havhesten, 15 km east of Vadsø. The Varanger fjord is known to be well stocked with fish. We go by boat for 5-10 minutes and then catch fresh seafood for several of our dishes; especially cod, wild salmon and of course Red King Crab or Kamsjatka Crab, their "Norwegian home" being the Varanger fjord. We also serve dishes of meat from reindeer. We serve home baked bread and various cakes. 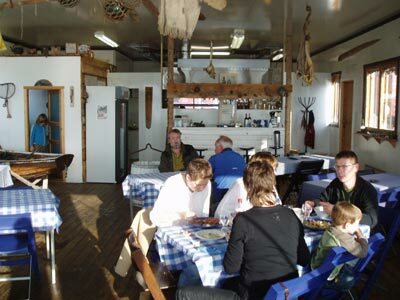 When open you may enjoy a good meal in an atmosphere from sea and from traditions. The sea goes under the fishing pier and under the floor of the restaurant. Through the panorama windows in the restaurant you can see the harbour and the village. When the weather is fine, we put outside some tables and chairs. There you even better can observe the sun moving above the horizon both day and night in the summertime.